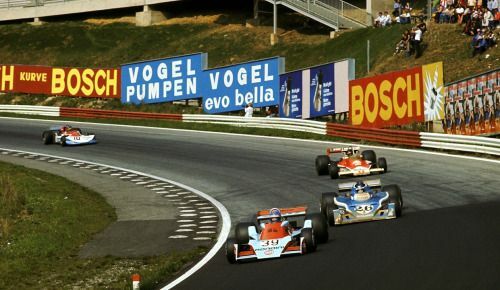 Classical Grand Prix of mid 70s, McLaren vs Ferrari years with rest of the teams still able to fight for victories. Two car F1 teams (drivers can still represent GR teams), full distance of 54 laps. Osterreichring by BBA and F1 cars by Krisu . Season includes a single race. The login will be ready since 16. February 2018. Last edited by Mad Dan on Mon Feb 19, 2018 11:20 am, edited 8 times in total. My brother Pava is joining too. Info's the same. Welcome guys I am going to update the entry list with your info . What? Really? How would I fix that (replay)? Update the downloadable pack in the OP and put the fixed gr.ini in the login zip. Today I am sending the passwords and readying the login page. I hope all of you who signed up will race, 10 drivers thats something in the current level . Apparently the webhost decided to freeze my website for an hour now as it is free unpaid hosting. It will be availabile today at nine. If that is a trouble I extend the deadline until tommorow. Sorry for this, I just found out . I've got '404 Not Found' for the second day in a row. EDIT: Oh. I see, it's 'temporary sleeping'. I'll wait. Last edited by Buka on Mon Feb 26, 2018 6:33 pm, edited 1 time in total. Next time I'll do it somewhere else. It worked ok for Mini GP S2 and S3 and Rally Trophy but what is going on right now is beyond me. Anyway I'll move it for the future . A very tough race, I hope it was fun drive. It was for me . Would you be interested in couple more simmilar events? Historic F1 races? Two laps behind the winner. Not so bad.